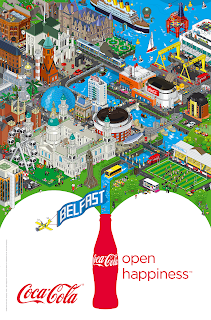 If you've gone for a stroll or taken a bus in Belfast in the past week or two, you'll probably have noticed a bright, colourful cityscape of Belfast acting as an advertisement for Coca-Cola. The posters feature mini pixel people, animals, monsters and robots wandering the streets, busking, selling what looks like the Telegraph, juggling, and sunbathing (! ), all in the shadows of some of the city's most iconic buildings and structures. There's City Hall (of course), but also the Gasworks, Bittles Bar, and the hills and the docks (complete with a string section onboard a ship that looks remarkably like the Titanic) off to the edges. They're designed by eBoy, who have been making posters for cities all over the world for a number of years. They recently gave Dublin a similar treatment for Coke. Check out more of their renderings of buildings and cities around the world.